Are you are new to making espresso at home? If Yes, you might not have thought about getting an espresso knock box or you might even don’t even know about what it is. It’s basically a small garbage bin for grounds with a metal bar to knock the portafilter. It might seem like an unnecessary complication – Do you really need a special accessory to knock the pucks out of your portafilter when you already have a perfectly good garbage can? Obviously Yes! Because the garbage bin cannot be knocked with the portafilter as the wrong knock will simply can damage both – the portafilter and the garbage can. 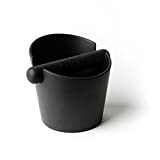 However, there are good reasons for using a dedicated Knock Box for Coffee Grounds with your coffee maker. One is cleanliness: If you’re tapping your portafilter inside your garbage can or composter, you’re going to have to wash it before you use it again. Second consideration is that (depending on what your garbage can is made of) you may end up damaging either your portafilter or your garbage can when you whack the side of the can. Using your sink as a knock box is also not recommended, as the grounds can clog your drain (at the most crucial point of time may be). It can also be called a Bash Bin or a Puck Box by a good coffee user. This little puck box is perfect for someone who pulls a few shots a day – more than that and you’re going to be emptying it pretty frequently. Otherwise, its small size has its advantages. It fits easily into the top rack of your dishwasher, and you can store it under the group head of most espresso machines when not in use, eliminating the need for more counter space. The Grindenstein is made of ABS plastic with a rubber coated steel bar. The bar is sturdy enough to withstand quite a lot of knocking, and customers report that it stands up well to years of regular use. It comes in your choice of silver, black or red. Some people are bothered by the fact that the bar is not removable, as it is with some other knock boxes. Others have said that the bar is too big relative to the size of the container, which can get messy if your portafilter is bigger than average. Also, for people who use their espresso maker a lot, this product is simply too small. But these are minor quibbles that come down to personal needs and taste. On the whole, the Grindenstein is one of the most popular choices out there. This model is too big to hide away under your group head, but with its stainless steel body it will look great on any countertop next to your espresso machine. At about 7 inches tall, it’s the perfect solution for somebody who pulls a lot of shots, or somebody who really doesn’t want to empty their knock box very often! It’s also big enough for light commercial use, for example in a restaurant where you only serve espresso a few times in a given shift. The bar is made of engineering grade polymer. Together with the inside vessel, it lifts out for emptying and is safe in the top rack of your dishwasher. The external vessel features a polymer ring on the bottom surface to prevent slipping. The bar is sturdy enough to hold up to repeated heavy use, and some people get pretty aggressive when knocking grinds out of their portafilters. The biggest complaint from customers was that the BCB100 is too big for some kitchens, but obviously this comes down to individual preference. 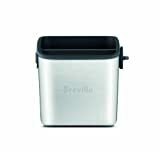 If you love the look of the Breville BCB100 but are looking for something smaller, the Mini may be the right choice for you. It is one of the best knock box available in the market. 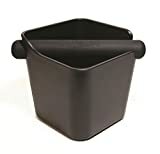 This square design is almost a perfect 4 ½ inch cube, and has a stainless steel canister with a black interior to reduce the visibility of the coffee grounds. This unit is sturdy enough to stand up to the most aggressive barista. There’s no official word on whether or not the Mini is dishwasher safe. However, the bar removes easily, allowing you to quickly dump out the grounds and give the interior a rinse and wipe. Cleaning doesn’t have to be more complicated than that. The stainless steel canister has rubber treads on the bottom to keep it stationary when in use. Along with the rubberized bar, these treads also reduce the noise when you knock the portafilter. There are few complaints with this model. The size is good for most casual home use. A few people find that the grounds can fly out of the box if you knock too aggressively, but the vast majority of buyers are very happy with the Mini. This knock box for espresso grounds is similar in design to the Grindenstein, though at 5 inches tall it has a bit more capacity. It is made of sturdy ABS plastic with a food-safe rubber bar. The bar comes out easily for fast cleaning. Tubbi is available in 4 different colors and has a playful, modern style. The back is taller than the front, acting as a mini-shield to prevent coffee grounds splattering all over your counter. It also features a non-slip rubber pad on the bottom to stabilize the knock box and reduce noise. The weak link in any box is going to be the bar, which literally takes a beating every time you pull a shot. If the bar is not removable, this means that you have to replace the entire product when the bar fails. With the Tubbi, the bar is easily removed and can be replaced if it gets damaged. The only common complaint with this model is that it is too small for some households. The good news is that the Tubbi is now also available in a larger size. This is another simple cube-shaped design. The 5 ½ inch box is made of wood and comes in your choice of brown, black or a light natural wood finish. The inside container is made of PVC and lifts out by lifting the knock bar. This container is not dishwasher-safe but still cleans up quickly and easily. The bar itself is somewhat unusual in that it is made of a hardwood dowel that matches the outer box. This is a classic design (as its name suggests) that hasn’t changed much since it came out in 1996. It is economical and with its “organic” look it will suit almost any kitchen décor. 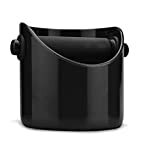 A perfect size knock box that can be stored beneath most of the espresso machines like Breville, DeLonghi and more. The capacity is ideal so that you don’t have to empty the grounds too very often. At the base, rubber grip is provided to avoid slips while knocking. The plastic used to build it up is antibacterial so, even if you’ve forgotten to empty the grounds, there will be no bacterial growth. For easy cleaning, the rod is detachable and dishwasher safe. The rod is made up of stainless steel coated with durable rubber foam to absorb most of your shocks or knocks easily. Moreover, the satisfication is guaranteed to such an extent, that if you are not happy with the product, you are allowed to return. Perfect Sizing – It’s perfect dimensions allow us to use it anywhere. 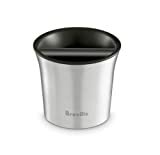 It’s not very tall nor very broad but still captures most of your ground espresso with it’s great capacity. Rubberized Base – It’s built in rubberized ring at the base grips it very well on the platform and also helps in absorbing the knocks and shocks. Antibacterial Body – The body is made up of antibacterial ABS plastic which prevents the bacterial growth. Easy Cleaning – The metal bar is removable and everything is dishwasher safe. 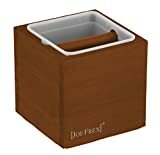 The above attributes makes it on of the perfect choice as an espresso knock box one might be looking for. Also, the price is very feasible as compared to most of the best available brands. New boy in the town of knock boxes, the Cafelat New. The only thing I think is different in this model is the shape. The shape is something unusual like other knock boxes and the look is actually what people consider when buying a knock box. There is nothing to learn about using a Knock Box. There is a metal bar at the center of the box were we have to hit the portafilter with used espresso grounds. One thing of learning is what amount of pressure is to be used to hit the box and once you have it, you’ll optimize that by yourself. It’s not a necessary or compulsory thing to use a knock box, but it does makes few things easy and clean. Getting a knock box makes complete sense when you are buying an espresso machine. If you are an engineer at home, then you can also try our espresso knock-box DIY. It can be easily made at home with just a few requirements. Having separate things for separate tasks makes a less mess and that matters a lot to many. You make an espresso daily, but it’s a strange thing if you still haven’t used a knock box.